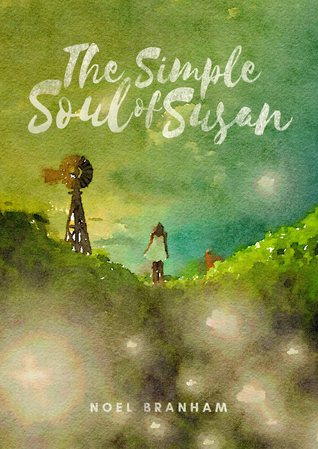 I was privileged to receive a free review copy of The Simple Soul of Susan by Noel Branham in the fall of last year. At that point I already knew I was falling behind on reviews, but I said yes because I just loved the idea of the story. And I’m so very glad I did! But one autumn day she overhears Calder and another boy having a conversation. This occasion of accidental audience sets Susan’s life on an unforeseen path. In the seasons to come, her future will be changed by two hospitalizations, two confessions of love, and one betrayal. The books spans a several-year time period, going season by season, which was a really interesting way to structure it. So many books focus on a much narrower time-frame, but this really enabled the author to develop the characters. The reader has the opportunity to see Susan and Calder grow up, and deal with the corresponding life transitions. Refreshingly, no character is perfect; even Susan has her faults and the author doesn’t hide them or rationalize them away. Rather, the book tells a real coming-of-age story as we watch Susan and Calder stumble along their respective paths as they discern where they’re headed in life. Despite enjoying the length of time the book spans, I did at times feel like the book was longer than it needed to be. I can’t tell you what I’d cut out because it all feels essential, it was more of just a feeling I had from time to time while I was reading it. That said, I highly recommend the book and I think it’s a solid debut novel. I’d love to read more of Noel Branham’s work in the future.